There are a few images that come to mind when I think of the phrase “bullet hell.” My mind immediately goes to such titles as Touhou and Gradius (and now Rigid Force Alpha), but that is just scratching the surface of my interactions with the genre. It all started in the arcade, as I popped quarters into coin-op machines that were designed to steal my money. I would guide the spaceship around the hordes of aliens and killer robots until I got to the big bad boss at the end of the level. All I would need to do is keep firing on the behemoth, and it would fall. The screen would fill up with “bullets” as the monster desperately tried to shake off my attacks. One final laser would shoot out of the monster’s mouth and catch me off guard. Game over. Arcade “side-scroll” shooters have been a dying breed for quite some time. As the gaming experience becomes easier to enjoy at home, many arcades have been liquidating their stock of classic games for new ones with improved graphics and design. Fortunately, some developers have not forgotten about how fun these games can actually be. 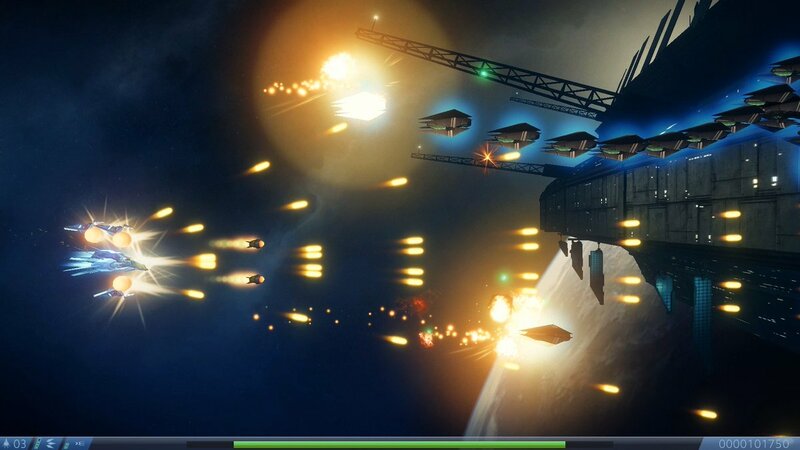 Indie developer Com8com1 Software recently released their newest title called Rigid Force Alpha. The game itself is a side-scroll shooter that appears to have been heavily influenced by the “bullet hell” games of yore. I had the privilege of playing this game shortly after its release, and after spending many hours on the title, I have a pretty good understanding about the experience and what players can expect when flying into the fray. As the players begin the game, they are immediately taken into an area where they will learn how to fly the Rigid Force Alpha, an experimental and powerful spacecraft. 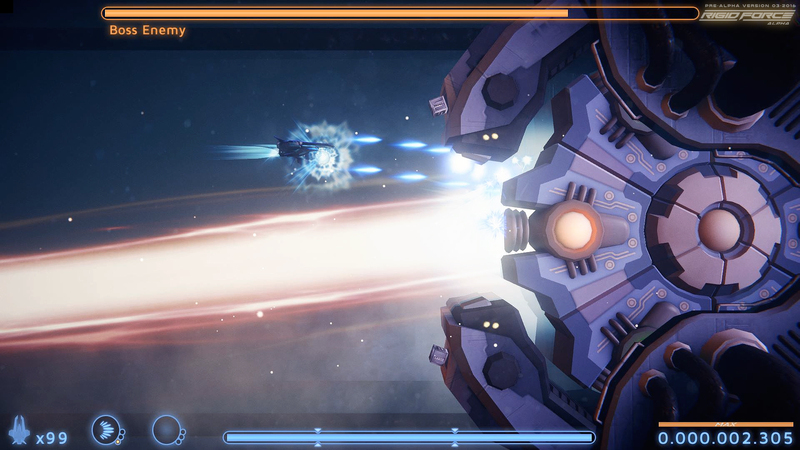 The ship’s onboard AI, known as Psye, pops up and instructs the players on how to use the controls to steer the ship, fire on enemies, and recharge power. 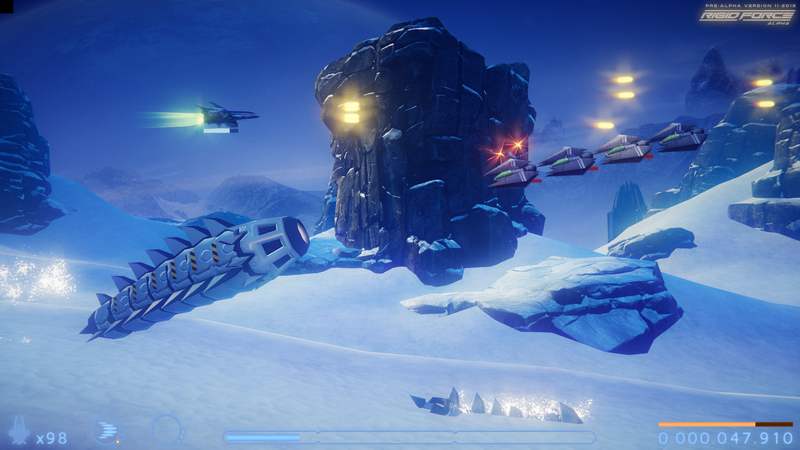 Various upgrades can be utilized by the players to increase the power and spread of their weapons, and this is mostly done by using “shards.” The Alpha can gather up to four shards that act as extra cannons and can be rearranged during gameplay to be in the front, top, or rear of the ship. After the tutorial, the real fun begins. There are six stages in this game, and players can choose to start a new campaign or enter into “arcade mode.” The campaign is a linear gameplay experience where you simply fly through the various levels shooting everything that moves and trying not to get shot in the process. Arcade mode is the same as the campaign, but it has extra collectibles within the levels and allows for the player to choose levels at will. The Alpha can sustain about three or four hits before being destroyed. After the ship is destroyed, all the power-ups that were claimed earlier will float off in different directions. The Alpha will respawn right where it was taken out. The power-ups can them be reclaimed, but the ship can only be destroyed three times in one level. After the third life, the player must press “continue” and start the level all over again. In classic shooter fashion, the player is given three lives and three continues, and after those are used up…game over. From the description of the gameplay, it is easy to see how this title can be difficult. The severe knockback that the game gives for losing all the player’s lives may seem unfair by today’s standards, but it was quite normal in the 80’s and 90’s. Rigid Force Alpha supplies a heaping helping “old school” difficulty to the gaming experience, and along with that comes “old school” frustration. The player is given the option to pick between an easy, normal, and hard campaign experience. Despite those options, the “easy” mode is by no means a walk in the park. Even the very first level presented a challenge as enemies sped by in straight formations, randomly shooting balls of energy at my ship. Many gamers may find this steep learning curve unappealing, but others who are more used to the genre will find it refreshing. Rigid Force Alpha might fit nicely into the bullet hell lineup, but it is not without its flaws. Along with being a fast-paced game, the action can often get overwhelming, leaving the player with no choice but to get pounded. Many sprites can get lost in the action as bullets fly everywhere amidst the ever-changing background. This creates “hidden hits” that the player could not possibly see. To be honest, one of the biggest deficits that Rigid Force Alpha has is that it is not an incredibly unique title. This game really doesn’t bring anything new to the shooter genre; if anything, it is a spiritual successor to the R-Type games. It is truly a gorgeous game, with stunning visuals and a decent story, but that’s it. Other shooters have used these tropes before. Unfortunately, this title is not unlike anything that gamers have played in the past. However, sometimes familiarity is a good thing. Rigid Force Alpha is a truly fantastic bullet hell shooter. The breakneck action combined with beautiful 3D environments make this game both fun and challenging. The harsh knockback coupled with the limited amount of lives and continues allows for the player to progressively get better at playing the game. This a great “lunch break” title and I highly recommend it to everyone. If you would like to play Rigid Force Alpha for yourself, it is now available for download on Steam. I give this game 8.5 plasma blasts out 10. Remember, you get three lives and three continues; no whining, please. Previous articleHow Uldir Mostly Succeeds as Both Fun and Challenging. I'm an OG gamer with a new perspective. However, games are what I play, not what I am. I am a loving husband, father of two beautiful children, and a pastor and counselor. With a graduate degree in both Theology and Philosophy from Liberty University, I seek to find how gaming can better bring people together.